The Tomato Better Boy is a popular all around hybrid, featuring high yields of smooth textured fruit with excellent flavor. Better Boy tomatoes consistently produces good yields of smooth, large, flavorful tomatoes that weigh about 1/2 to 1 pound each. 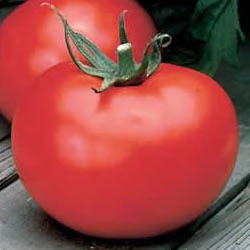 The Better Boy tomatoes are deep red and meaty and have dense foliage cover so fruits are less likely to get sun scaled.